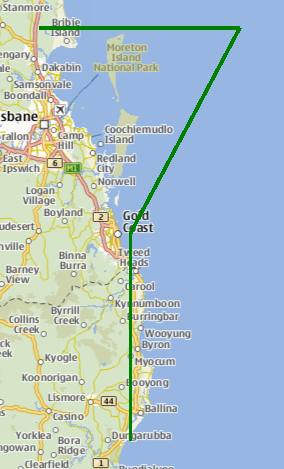 The MapPolyline type displays a polyline on a map, specified in terms of an ordered list of coordinates. The coordinates on the path cannot be directly changed after being added to the Polyline. Instead, copy the path into a var, modify the copy and reassign the copy back to the path. Coordinates can also be added and removed at any time using the addCoordinate and removeCoordinate methods. By default, the polyline is displayed as a 1-pixel thick black line. This can be changed using the line.width and line.color properties. MapPolylines have a rendering cost that is O(n) with respect to the number of vertices. This means that the per frame cost of having a polyline on the Map grows in direct proportion to the number of points in the polyline. Like the other map objects, MapPolyline is normally drawn without a smooth appearance. Setting the opacity property will force the object to be blended, which decreases performance considerably depending on the hardware in use. Note: MapPolylines are implemented using the OpenGL GL_LINES primitive. There have been occasional reports of issues and rendering inconsistencies on some (particularly quite old) platforms. No workaround is yet available for these issues. The following snippet shows a MapPolyline with 4 points, making a shape like the top part of a "question mark" (? ), near Brisbane, Australia. The line drawn is 3 pixels in width and green in color. This property holds the ordered list of coordinates which define the polyline. Adds a coordinate to the end of the path. See also insertCoordinate, removeCoordinate, and path. Returns true if the given coordinate is part of the path. This QML method was introduced in Qt Location 5.6. Gets the coordinate of the polyline at the given index. If the index is outside the path's bounds then an invalid coordinate is returned. Inserts a coordinate to the path at the given index. See also addCoordinate, removeCoordinate, and path. Returns the number of coordinates of the polyline. Removes a coordinate from the path at the given index. If index is invalid then this method does nothing. See also addCoordinate, insertCoordinate, and path. Removes coordinate from the path. If there are multiple instances of the same coordinate, the one added last is removed. If coordinate is not in the path this method does nothing. Replaces the coordinate in the current path at the given index with the new coordinate. See also addCoordinate, insertCoordinate, removeCoordinate, and path.